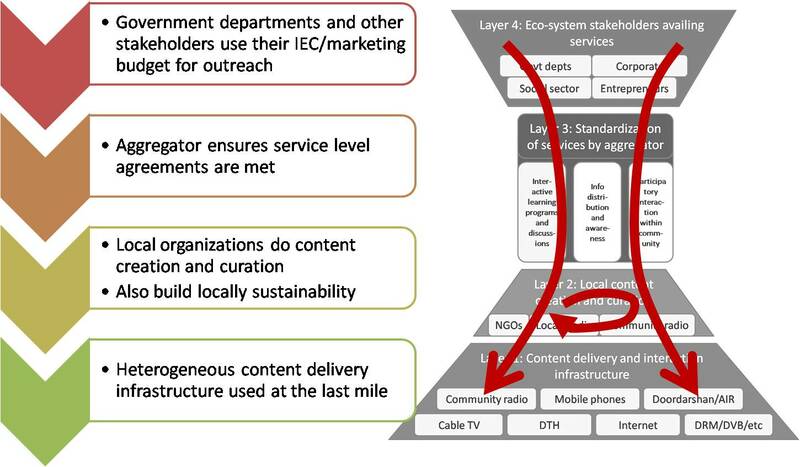 Download our whitepaper on sustainable rural information service networks. Excerpts are below. The role that the Internet has played in building awareness through information access and building collaboration through interactive info services cannot be denied. But the Internet has made one other fundamental contribution. Even though Internet access is available currently to only 150M Indians, projected to increase to 300M by 2017, leaving just as large a population without access to the Internet, the Internet has demonstrated the NEED for universal information services, irrespective of the nature of the infrastructure. The Internet has shown how interactive information services can be useful to make people aware, allow self expression, allow participation in governance discourse, and use info services to supplement existing economic activities while also creating new markets. The rest of this whitepaper aims to unpack these layers and demonstrate how this eco-system can be enabled sustainably. Local revenue generation by content creation and curation organizations: Entities such as community radio stations already get revenues from local advertisers and classifieds, which is not sufficient for them to break even, but does help cover up to 20% of their operational costs. Some networks are also partly supported through micro-donations from the community, but these are rare exceptions. Channeling of third party funding: Government departments, development agencies, and corporate organizations are keen to sponsor interactive learning programs, information dissemination, and community participation in governance decision making. The current gap lies in assuring SLAs on outreach, quality of programming, measurable return on investment, and coverage in desired geographies.